We came to remember the dead, not to add to the death count. But by the end of the day, a reported 16 more people were killed and nearly 200 were injured. The peaceful march was turned into a massacre. 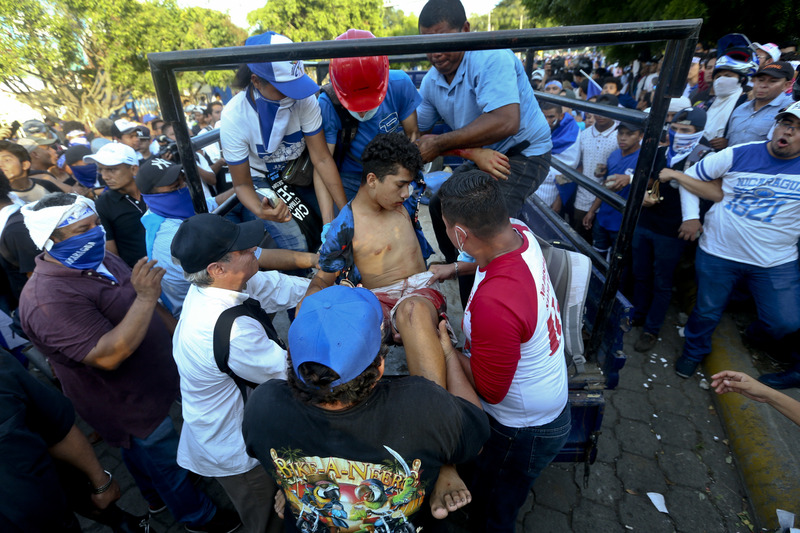 May 30 was Mother’s Day in Nicaragua, but who could celebrate with over 80 deaths and hundreds wounded since mid-April? Thousands took to the streets across the country. The marches were organized to show solidarity with mothers who have lost sons in the past six weeks of protests against the government of President Daniel Ortega. Along with other participants, I dressed in a black shirt to commemorate the dead and wrapped the blue-and-white flag of Nicaragua around my shoulders. In the early afternoon, I stopped near Rotonda Jean Paul Genie to gather with teachers from Instituto Loyola, one of the Jesuit high schools in Managua. They came to mourn and commemorate the death of one of their own: 15-year-old Álvaro Conrado, a Loyola student killed in the early days of the protests. He took a bullet to the throat, and his final words, “me duele respirar” (“it hurts to breathe”), have become one of the catchphrases of protesters. His face adorns T-shirts, baseball hats and banners. We came to remember the dead, not to add to the death count. As the march headed north to the campus of the University of Central America, the Jesuit university of Nicaragua, the streets were packed with people. The four-lane highway and both adjoining service roads were full of marchers. Mothers carried photos of their fallen sons. Students locked arms in solidarity. People chanted, “Un pueblo unido jamás será vencido” (“A people united will never be defeated”). Just two miles away, a simultaneous rally was being held by President Ortega and his dwindling group of backers. A few thousand people had gathered to hear him speak and show their support. He took to the stage at around 4:30 p.m., just as the nearby Mother’s Day March was nearing its end. The crowd chanted with Mr. Ortega, “Queremos la paz” (“We want peace”). The Mother’s Day March had reached the U.C.A. when the marchers heard shots were fired just down the street at the National Engineering University. Chaos broke out. Thousands of peaceful marchers went into a panic at the sounds of gunfire. While Mr. Ortega’s crowd chanted for peace, paramilitary groups were firing at student protestors. I was already back at the Jesuit community when I heard the news of the outbreak of violence. Injured students were being taken to nearby hospitals. José Alberto Idiaquez, S.J., the rector of U.C.A., had ordered security guards to temporarily open the main gate of the school to allow civilians to flee the violence. A crowd of people, including elderly and children, surged onto campus seeking safety. While Mr. Ortega’s crowd chanted for peace, paramilitary groups were firing at student protestors. Many people passed through campus and used other exits. A classroom was converted into a triage center to treat a couple of injured students who waited for ambulances to arrive. By nightfall, a few hundred people remained on campus, huddled together in small groups and messaging loved ones to let them know they were O.K. We organized transportation to evacuate people from campus and drop people off near their neighborhoods. By 10 p.m., the campus had been emptied and a calm had returned. But the damage was done. The Nicaraguan Center for Human Rights reported on Thursday morning that 11 had been killed and 79 injured across Nicaragua that Sunday. Six of the deaths and 47 of the injuries were from the attack after the Mother’s Day March in Managua. These numbers have since risen: a local newspaper reports at least 16 dead. Nicaragua marched in solidarity with mothers who had lost sons, and now more have been inflicted with this same pain. What began on April 18 as a call to revoke a proposed social security reform has shifted dramatically to an all-out demand for democratic reform and the immediate resignation of President Ortega and his wife, Rosario Murillo, who serves as vice president. The negotiations mediated by the country’s Catholic bishops that have been held over the past couple of weeks between representatives of the government, civil society, student protesters and universities have not produced the desired results. Last week, the negotiations had reached a stalemate when participants could not agree on the agenda. The government refused to discuss democratic reform and continued to insist on the dismantling of citizen-led roadblocks that have been erected throughout the country to keep economic pressure on the Ortega regime. Just days ago, the government conceded and agreed to discuss democratic reform, and a new round of dialogue was scheduled to begin on Thursday. But in light of the Mother’s Day Massacre, the Catholic Bishops Conference released a statement early Thursday morning in which they publicly condemned the acts of violence and announced that the dialogue could not resume as long as the government continues its violent repression of peaceful protesters. “Nicaragua está de luto” (“Nicaragua is in mourning”) read the banners at the Mother’s Day March yesterday. With more names added to the list of the dead during the ensuing massacre, the country continues to mourn. If Mr. Ortega truly wants peace, he needs to hear the cry of the people: “Que se vaya” (“He must go”). Brian Strassburger, S.J., is a Jesuit scholastic working at Asociación Roncalli-Juan XXIII, a Jesuit-sponsored development non-profit in Managua, Nicaragua.